Holy Nobleborn Prince Theodore (Feodor) of Smolensk and Yaroslavl', nicknamed the "Black" (i.e. "dark" or "swarthy"), was born in years terrible for Rus' – those of the Mongol invasion, about 1237-1239, and at Baptism he was named after the holy GreatMartyr Theodore Stratilates (Comm. 8 February), who was particularly esteemed by the Russian warrior-princes. And holy Prince Theodore also was destined by God to be famed in the Russian Land by military exploits. In the year 1239, when through the prayers of the MostHoly Mother of God, the holy Warrior-Martyr Merkurii (Comm. 24 November) delivered Smolensk from being captured by Batu, the child Theodore was not in the city: they had taken him away and hidden him in a safe place during the warfare. In the following year of 1240 died his father, prince Rostislav, who was a great-grandson of holy Prince Rostislav of Smolensk and Kiev (+ 1168, Comm. 14 March). His elder brothers as heirs divided among themselves the lands of their father, allotting to the infant child Theodore the small holding of Mozhaisk. Here passed his childhood, and here he studied Holy Scripture, the church-services and the military art. In the year 1260 holy Prince Theodore was married to Maria Vasil'evna, daughter of holy Nobleborn Prince Vasilii of Yaroslavl' (+ 1249, Comm. 3 July), and Theodore became prince of Yaroslavl'. 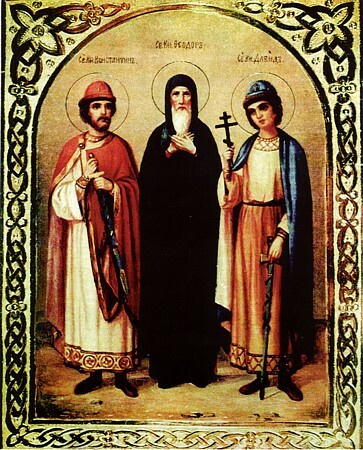 From their marriage was born a son Mikhail, but Saint Theodore was soon widowed. He spent much of his time at military efforts and campaigns, and his son was raised by his mother-in-law, princess Xenia. In the year 1277 the allied forces of the Russian princes, in union with the Tatar forces, took part in a campaign in the Osetian land and in the taking of "its famed city Tetyakov". In this war the allied forces gained a total victory. From the times of Saint Alexander Nevsky (+ 1263, Comm. 23 November), the khans of the Golden Horde – seeing the uncrushable spiritual and the military strength of Orthodox Rus', were compelled to change their attitude towards it, and they began to draw the Russian princes into alliances, and the khans then turned to them for military assistance. The Russian Church providentially made use of this drawing closer, for the Christian enlightenment of the foreigners. Already in the year 1261, through the efforts of Saint Alexander Nevsky and Metropolitan Kirill III at Sarai, the capital of the Golden Horde, there was established a diocese of the Russian Orthodox Church. In the year 1276, a Constantinople Council presided over by the patriarch John Bekkos (1275-1282) gave reply to questions of the Sarai Russian bishop Theognost about the order for baptising Tatars, and also the receiving into Orthodoxy of the Monophysite and Nestorian Christians among them. During these years also, holy Prince Theodore was at the Horde. Having distinguished himself by military exploits on the Osetian campaign, he gained special favourable attention from khan Mengu-Temir, who regarded the Orthodox Church with respect, and who as khan issued the first "yarlyk" ("decree" or "grant") about church tax-exemption for Metropolitan Kirill. In the chronicles it said: "And prince Feodor Rostislavich the emperor Mengu-Temir and his empress did favour fondly and did not want to permit him return back to Rus' on account of his bravery and the handsomeness of his face". Saint Theodore spent three years at the Horde. Finally, "the emperor did send him off with great honour", and the prince arrived in Yaroslavl'. His wife Maria had already died, and in the city ruled princess Xenia with her grandson Mikhail. The Yaroslavians would not let in the prince returning from the Horde: "not accepting him onto the city but saying to him: "this be the city of princess Xenia and Mikhailo is our prince"". Saint Theodore had to return to the Horde. The empress, wife of khan Mengu-Temir, "did have exceedingly great fondness for him and did wish for him to give the hand of her own daughter". Such a marriage had tremendous significance for Rus'. For a long time the khan would not consent to this, considering the Russian princes to be "ulusniki" (i.e. "vassals" or "subjects"). To give in marriage his daughter to a Russian prince meant to acknowledge him as an equal in worthiness. And even more important: this meant the khan would acknowledge the primacy of Orthodoxy, since before the wedding rite of crowning it required that the Tatar princess would accept holy Baptism. The khan went along with this, since union with Russia was very important for him: "and he ordered his daughter be given to prince Feodor, and ordered first to baptise her, and he ordered the Orthodox faith not be desecrated". Thus was Saint Theodore married to the daughter of the mighty khan, who was baptised with the name Anna. "The emperor didst esteem exceedingly and commanded him be seated opposite himself, he built him a palace, and gave princes and bolyarini-nobles in retinue". There at the Horde also were born Saint Theodore's sons – holy Nobleborn Prince David (+ 1321) and holy Nobleborn Prince Konstantin. The tremendous influence, which Saint Theodore gained at the Horde, he used to the glory of the Russian Land and the Russian Church. Orthodoxy became all the more strengthened amongst the Tatars, and the Horde began to assimilate Russian customs, morals and piety. Russian merchants, architect-builders and skilled craftsmen carried Russian culture to the shores of the Don, the Volga, the Urals and farther even into Mongolia itself. From this period archeologists find Orthodox icons, and crosses and lampadas, throughout all the former territories of the Golden Horde, since included into the makeup of Russia. Thus began a great missionary movement of the Russian Church towards the East, and the enlightening with the light of the Gospel truth of all the tribes – all the way to the Great Ocean (i.e. the Pacific). Russian Orthodox princes and their retinues, participating as confederates in the Mongol campaigns, learned of and became familiar with the boundless expanses of Asia, Siberia and the Far East. In the year 1330, more than thirty years after the death of Saint Theodore, Chinese chronicles write about Russian retinues in Peking. Saint Theodore lived in Sarai until 1290, when "news reached him from Rus', from the city of Yaroslavl', that his first son, prince Mikhail, had died". Having bestown the prince rich gifts and a large retinue, the khan sent him back to Rus'. Having become again the prince at Yaroslavl', Saint Theodore began zealously to concern himself over the strengthening and building up of his city and principality. He had an especial love for the monastery of the Transfiguration of the Lord. His fame resounded throughout all Rus', and all the princes sought friendship and alliance with him. But most of all, he was fond of the son of Saint Alexander Nevsky, – Andrei Aleksandrovich, supporting him in all undertakings, and when this prince Andrei became great-prince of Vladimir, he went with him on military campaigns; he was gladdened over the victories, and he grieved over his being cut down in defeat. In 1296 a bloody fratricidal war was just breaking out between two groups of princes: on the one side was Saint Theodore and Great-prince Andrei, and on the other side – Saint Michael of Tver (+ 1318, Comm. 22 November) and Saint Daniel of Moscow (+ 1303, Comm. 4 March). But with the help of God the bloodshed was successfully averted. At a Vladimir "sitting of princes" (year 1296) the Vladimir bishop Simeon and the Sarai bishop Izmail managed to bring peace to both sides. This fact, that holy Prince Theodore and the Sarai Vladyka Izmail participated in the sitting, points out that Saint Theodore employed all his diplomatic talents and influence at the Horde, to enable the establishing of peace in the Russian Land. The connections of Saint Theodore the Black with his paternal origins – Smolensk, were not sundered, though for him to be prince there would have been complicated. Thus, in the year 1297, Saint Theodore went on a campaign to Smolensk to renew his lawful right to the Smolensk principality, which had been usurped by his nephews. But to take the city and become anew the Smolensk prince did not transpire. Soon after this campaign the holy warrior-prince took sick. On 18 September 1299 the saint of God gave orders that he be carried to the Saviour-Transfiguration monastery, and there he took monastic tonsure. Towards the end of the ritual, Saint Theodore asked to interrupt the service. With the blessing of the hegumen, and to fulfill the will of the dying prince, they carried him into the monastery courtyard, whither had already come a throng of the Yaroslavl' people. "And the prince did confess before all the people, whether he had sinned against anyone or held ill-feelings against anyone. And whoever had sinned against him or borne him enmity – he blessed all and begged them pardon and in everything took upon himself the guilt before God and mankind". Only after this did the humble warrior complete his resolve to finish his unusual and much-troubled life's path with the acceptance of the angelic form. All night the hegumen and the brethren prayed over the holy prince. At the second hour of the night they began to ring for matins. Administered the Holy Mysteries of Christ, Saint Theodore lay silently upon his monk's cot. When the monks began the third "Glory" of the Psalter, he made the sign of the Cross and gave up his soul to the Lord. His appearance at the grave was extraordinary: "Wondrous indeed was the look of the blessed one, upon the cot lay he not as one dead, but as one actually alive. His face did shine like as the rays of the sun, adorned by his venerable grey of hair, witnessing to his purity of soul and heart without malice". After him at Yaroslavl' ruled his son – Saint David (+ 1321). The second of his two younger sons, Konstantin, had evidently died earlier. The Church veneration of holy Prince Theodore within the Yaroslavsk lands began soon after his death. During the years 1322-1327, with the blessing and commissioning of the Rostov bishop Prokhor, – in memory by the Vladyka of the venerable Saint Theodore, – there was written and adorned with miniatures the reknown Theodorov Gospel. Bishop Prokhor at first had been hegumen of the Saviour-Transfiguration monastery at Yaroslavl'. Actually, he knew the holy prince personally, and was able to be an eye-witness at his tonsure and public repentance before the people. Historians think, that the fine miniatures, sewn into this precious manuscript, had belonged to a rather earlier Gospel, the owner of which had been Saint Theodore the Black himself, and which he had brought with him to Yaroslavl' as a blessing from his native Smolensk. On 5 March 1463, there were opened at Yaroslavl' the relics of holy Prince Theodore and his sons, David and Konstantin. The chronicler, an eye-witness to the event, recorded under the year: "At the city of Yaroslavl' in the monastery of the Holy Saviour they did bring up three great princes, prince Feodor Rostislavich and his sons David and Konstantin, and above the ground they did lay them. Great-prince Feodor was a man of great stature, and of his sons David and Konstantin they did lay them alongside, and their stature was less than his. They did lay within a single grave". This feature of the physical appearance of the holy prince so struck the senses of the eye-witnesses and those present at the time of the uncovering of the relics, that an account of this was entered into the Prologue's Saints-lives concerning Saint Theodore, and also into the text of the Iconographic Originals. The Life of holy Prince Theodore the Black was written, shortly after the uncovering of the relics, by the priest-monk Antonii of the Yaroslavsk Saviour monastery, with the blessing of the Metropolitan of Moscow and All Rus', Philip I. Another redaction of the Life was written by Andrei Yur'ev at the Kirillo-Belozersk monastery. A third and most detailed Life of Saint Theodore was included in the "Book of Ranks of Imperial Geneology", compiled under tsar Ivan the Terrible and metropolitan Makarii. The Russian people put together spiritual songs about holy Prince Theodore, which over the span of centuries they sang in "the destitute wanderings". In them, the verses glorify the piety and the right-discernment, the beneficence and kind-heartedness of the saint, and his concern over the building and adorning of churches. The complexity of historical destinies, the roughness of the era, the numerous multitude of enemies – not personal, but enemies of Russia and the Church, – stress for us all the more clearly the great exploits of the saintly builders of the Russian Land.